Amtrak train travel is the main avenue for passenger train travel in the United States. The U.S. government is the preferred stockholder of Amtrak and took over the passenger train corporation in the 1970s as a way of keeping passenger trains running. Amtrak train travel is a great way to see the nation when traveling from city to city. The cost of Amtrak train travel is comparable to commercial airlines, particularly with the increases in baggage fees in the early 21st century. While passenger trains take longer to cover great distances, the average trip from Dallas to New York is about 15 to 17 hours while a cross country trip could take up to two days. Another benefit of traveling via Amtrak is access to the rolling countryside and natural sites often missed while driving. For business travelers, work can still be completed because the driving is left to the engineer. Passengers can get up and walk around and most lines have a dining car, allowing for up to three different meals during the day of travel. So whether you want to read, chat with friends, watch a movie on a portable device or sleep, the passenger train system is a comfortable way to get from point A to point B. 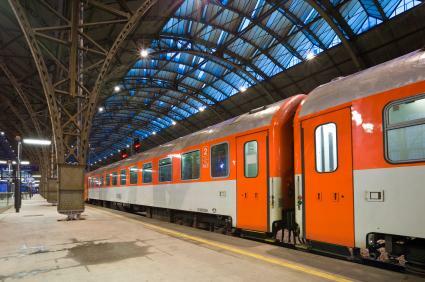 Not every station offers baggage service, so during your trip planning you should verify that both the station you are departing from and your destination offers it. For long distance trips, your train will have a car attendant who serves as a flight attendant of sorts and will be available to help see to your needs. The dining cars will also have staff for serving and taking your order. In addition to the general personnel, each train has an engineer, conductor and various assistant engineers and conductors. Amtrak offers 33 routes to more than 500 destinations in 46 separate states. The routes are often broken down by region. In the northeast, for example, the Acela Express travels through Boston, New York, Philadelphia and Washington D.C. while the Adirondack travels through New York, Albany and Montreal. The routes are determined by the major cities the train services. Longer distance routes include the Crescent which travels from New York to Atlanta and down to New Orleans. The cheapest or discount train tickets are available through different outlets, including Amtrak directly. Amtrak offers discounts to students, seniors and others. During various seasons, Amtrak will also advertise promotional offers. When you're planning a trip via Amtrak, visit the website regularly for weekly specials and check travel magazines and other outlets for promotional codes that you can use to reduce the cost of your train tickets. When planning your trip, you have some travel options. All passenger trains offer coach accommodations. This is far roomier than your typical airplane seat. Trains designed for longer distance travel will also have foot and leg rests. You should pack a light blanket for sleeping if you are planning to doze. Like the airlines, passenger trains also offer a business class section. The seats are larger and offer more amenities, including tables or trays that you can work at. Finally, different long distance trains also offer sleeper cars. Amtrak offers a variety of sleeper options from bedrooms to bunk beds. The cost is commiserate with the level of comfort and amenities. Bedding, wash clothes, towels and soap are also made available to sleeper passengers. For first class passengers, coffee, tea and juice will be delivered to the sleeper car. Travel, dining and sleeper cars are the primary cars you will see when traveling via Amtrak. Long distance trains also offer a lounge car. These lounge cars are open to the passengers regardless of ticket class for chatting, meeting and sightseeing. The lounge car also boasts a bar counter where beverages, light snacks and desserts may be purchased. All passenger trains are smoke free. Long distance trains will make frequent stops allowing passengers to step off onto the platform to smoke. Some trains offer a "smoking car" with a separate ventilation system, but these are not typical. For more information on trip planning, visit Amtrak's website and their National Timetables and Travel Planner.